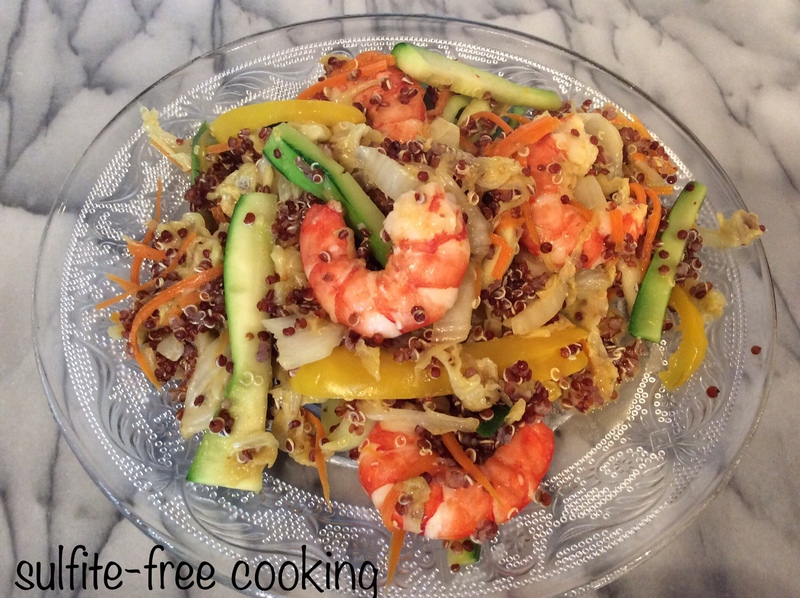 quinoa and vegetable medley curry with chicken or shrimp, and a nutty season for a nutty neighbor! Anyway, this is to show that often you can happily ignore the list of ingredients in a vegetable-based dish and just use what you have available to you. You might get some very interesting results ! I also realized that this meal didn’t take me more than half an hour to prepare once the shrimp was shelled. NOTE: If you like the idea of mixing quinoa and vegetables, I have a recipe with similar ingredients, but no curry or coconut milk, here. – some chicken or shrimp ; luckily for us I have been able to find completely additive and preservative-free frozen shrimp both in France and in the U.S.
– hot pepper (optional) – ours is a gift from one of my cousins, completely organic, grown in their garden and dried in their kitchen ! * The recipe for my GF pizza dough will be posted eventually, it’s only a matter of time. 1. Cut chicken into thin strips / shell and devein shrimp. 2. Wash and rinse quinoa thoroughly. Place in pan with twice amount of water, cover and start cooking separately. You will have to drain out any excess liquid at the end. 3. Cut napa cabbage lengthwise and chop. Cut pepper into strips and zucchini into sticks. 4. In a wok, heat 1 tsp coconut oil, add curry powder, chopped napa cabbage, pepper strips and julienned carrot (I do it directly in the wok over the other vegetables). Cook, stirring, for 2 to 3 minutes, until the cabbage starts looking translucent. The first vegetables to go in. Actually, the carrot could go later. 5. Add zucchini, salt, shrimp or chicken, coconut milk, white pepper, and hot pepper if desired. Stir and cover. Cook for some 6 to 7 minutes, until the shrimp is bright pink or the chicken is thoroughly cooked. 6. Add drained quinoa and mix well before serving. You can, like my husband, season with a little tamari in your plate. Enjoy! It has been a while since my last post, dear neighbors. This is the time of year when I get busy preparing for the winter months, making hot pepper sauce (recipe in French here – I just realized it needs to be translated for this blog!) and gathering walnuts from our yard. We have a lot this year, in spite of the drought (no real rain in over four months…). a far cry from the bleached walnuts found in the stores! and inside the shells some of the nuts have a blackish skin, as though they got sunburned. The flesh is still good to eat but it’s really weird. Yikes! Straight from a Hitchcock classic! Have a great autumn, dear neighbor! I was planning on making quinoa power bowls for dinner tonight. This gave me some fresh ideas. Merci! Oh, you are very welcome. I hope you have fun looking inside your fridge deciding what will go into your power bowl 😊. Hi Kathryn! You know what else was scary? A husband perched up in the trees to shake the walnuts off 😰… Thank goodness he is a lot more agile than I am — no broken limbs here! this sounds and looks amazing for autumn!